Astrium has been commissioned to build two new research satellites for NASA’s Jet Propulsion Laboratory (JPL). 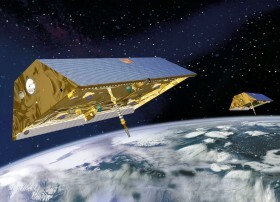 For a minimum of five years from August 2017, the Gravity Recovery and Climate Experiment Follow-On (Grace FO) mission will continue the extremely accurate measurement data collection of the first twin Grace satellites, which have been in orbit since 17 March 2002. Astrium’s Grace satellites have been making an important contribution to global climate research since 2002. Based on their observations of changes in the Earth’s gravity field over time, geoscientists are gaining new insights into the dynamic processes in the planet’s interior, into deep and surface currents in the oceans, and into variations in the extent of ice coverage at the poles, in Greenland and over mountain ranges. The original Grace mission allowed scientists for the first time to identify which masses of water, ice and solid material are moving; Grace is even able to provide long-term observation of water table levels around the world. Each of the Grace FO satellites measures approximately 3 x 2 x 0.8 metres and weighs around 580 kg. Like their predecessors, they will be placed in a polar orbit at an altitude of some 500 kilometres and follow each other 220 km apart. As they fly, the two satellites constantly, and extremely precisely, determine the distance between them, which varies under the influence of the Earth’s gravity; this fluctuating distance provides the data for continued measurement of our planet’s gravity field. The measurements taken by the Grace FO satellites will be exceptionally accurate because their positions will be minutely ascertained using on-board GPS receivers, while a satellite-to-satellite microwave link will enable the exact distance between them to be calculated to within a few thousandths of a millimetre. In contrast to the original Grace mission, the distance between the new satellites will also be measured using lasers – a technological experiment in preparation for future generations of gravity-research satellites.